Heat the oven (with the oven rack in the middle) to 350°F. 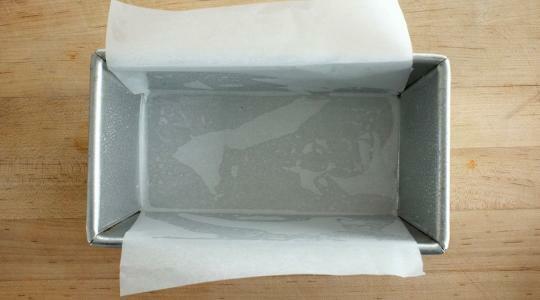 Spray a 9 x 5-inch loaf pan with cooking spray. 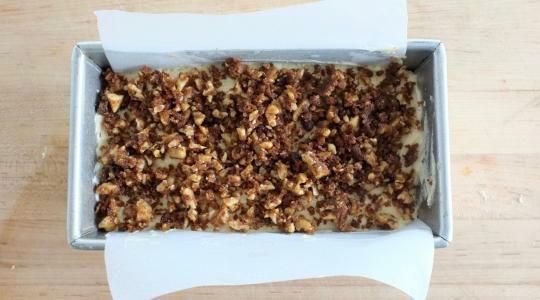 Line the pan with parchment paper, leaving an overhang on the two long sides. 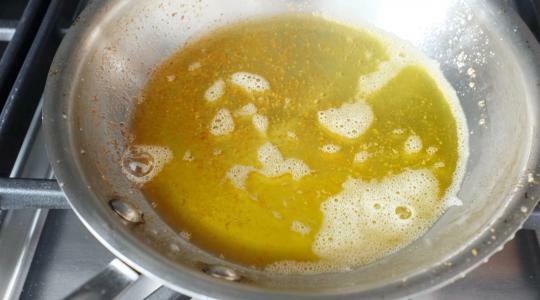 To make the topping, in a small skillet melt the butter over medium heat. Swirl the skillet for about 2 minutes, or until the butter solids start to turn golden brown and smell nutty. 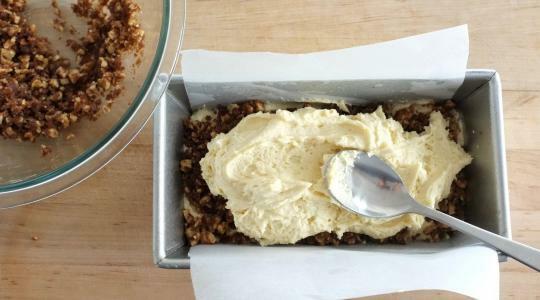 Scrape the butter and solids into bowl and let cool. 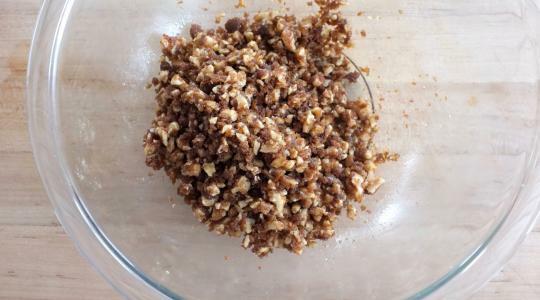 Coarsely chop the walnuts and put into a medium bowl. 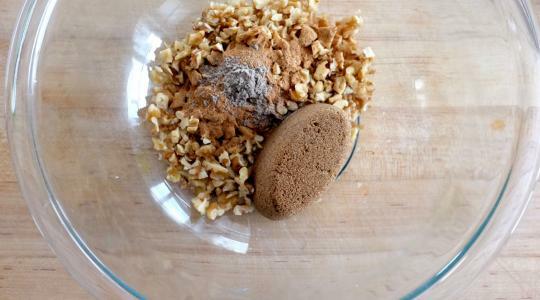 Add the brown sugar, cinnamon, and cardamom and combine with your fingertips. Add the butter and stir to combine. 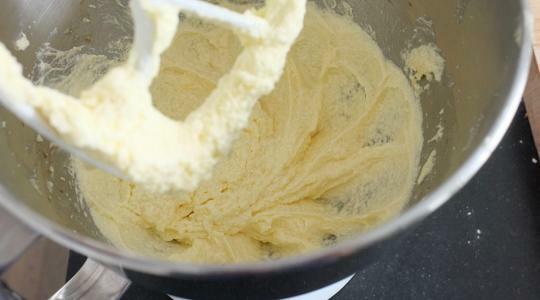 To make the cake, in a large bowl or the bowl of a stand mixer, using an electric mixer on medium-high speed, beat the butter and granulated sugar for about 2 minutes, or until fluffy. Beat in the eggs one at a time until well combined. Beat in the vanilla. 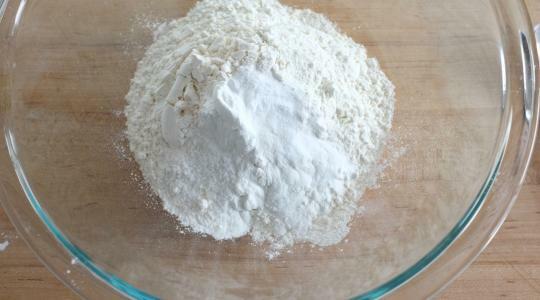 In a medium bowl, whisk together, the flour, baking powder, baking soda, and salt. On low speed, mix in half of the flour mixture. Then mix in the sour cream. Now mix in the remaining flour. Do not over mix. Spread half of the batter evenly in the bottom of the prepared pan. Sprinkle in half of the topping. Spread in the remaining batter. Sprinkle the remaining topping over the top. Bake 45 to 48 minutes, until a toothpick inserted into the center comes out with a few moist crumbs. Better to under bake than over bake. Let cool on a wire cooling rack for 20 minutes. 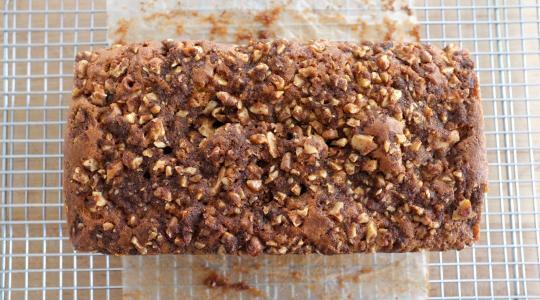 Grab the edges of the parchment and lift out the cake. 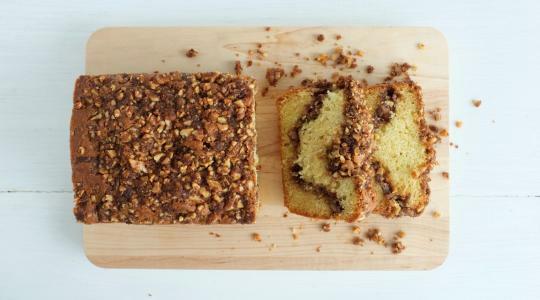 Let the cake cool completely before slicing.